Wed & Sat: by Appt. The spring season is notorious for causing some people a lot of misery. Itchy, watery, and painful eyes can make the prettiest time of year the most dreadful. However, there is good news for those of you who suffer from seasonal allergies- relief is possible. If your eyes overreact when pollen starts falling, you probably suffer from a condition called allergic conjunctivitis or ocular allergy. It happens when something you’re allergic to affects the conjunctiva. The conjunctiva is the membrane that covers your eye and eyelid. The reason your eyes turn red, itchy, watery and painful is that your immune system has identified something in the air as a threat. This threat is considered an allergen. Since your immune system believes it’s harmful to you, it stimulates the production of antibodies called Immunoglobulin (IgE). These antibodies are what end up causing an allergic reaction – your eyes become inflamed and bothersome to you. 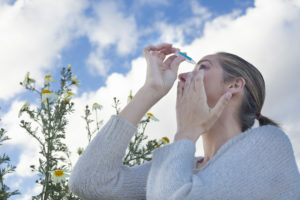 Seasonal allergens are the most common cause of conjunctivitis. Pollen and mold spores can quickly trigger the immune system to set off the production of Immunoglobulin. This is especially true when the pollen count is high on certain days. Ocular allergies pose no threat to your eyesight and they are not contagious. It’s not like pink eye, even though the redness can appear like it. The allergic reaction can impact sufferers’ quality of life, though. Blurry vision and constantly rubbing the eyes can interfere with work and having a good time outdoors when the weather warms up. This can be highly depressing, which is why most people who deal with this end up making an appointment with their optometrist. An optometrist, or eye doctor, will perform a thorough eye exam. This exam will include asking questions about your symptoms and using eye instruments to take a deep look into the eyes to rule out any other issues. If seasonal allergies are suspected to be the cause of the eye irritation, the optometrist may request that you seek an allergy test. The allergy test results will confirm your eye problems are due to pollen and/or mold spores. Artificial Tears – Artificial tear drops can help wash the allergens out of the eye, which can reduce the irritation. Eye drops can be used several times a day as needed for relief. Decongestants – Some eye drops contain decongestants and antihistamines, which can provide more relief than artificial tears do. These eye drops are a form of medication, so they should only be used two to three days, and they should not be used for a long time. It’s best to speak to an optometrist for the length of time you should use them. Oral Antihistamines – Allergy medications that contain antihistamines can help relieve eye allergies, as well as sinus congestion. Corticosteroids – These prescription eye drops can help people who have severe ocular allergic reactions. They are effective in reducing redness, swelling, and itching. Allergy Shots – For people who struggle with allergic reactions regularly throughout the year, allergy shots may be a consideration. These shots, also called immunotherapy, have a small amount of the allergen in them. As your body is exposed to the allergen with the shots, your body becomes immune to it. Over time, you will notice your eyes won’t react to seasonal allergens anymore. If you’re suffering from eye allergies, contact Apple Eye Care in El Paso for an appointment. Our optometrists can help relieve the discomfort you’re feeling, so you can fully enjoy the beautiful spring season! Wed & Sat by Appt.